For a freshman drama like Miami Medical, putting a main cast member in mortal danger so early in the series’ run is a risky move. But show creator Jeffrey Lieber tells TVGuide.com it was a necessary one. “One of the things we found out from doing research is that one of the particularities of trauma is that because there’s so much violence involved, the rate of doctors and nurses who are harmed is much higher than in the ER and the regular medical profession,” Lieber says. 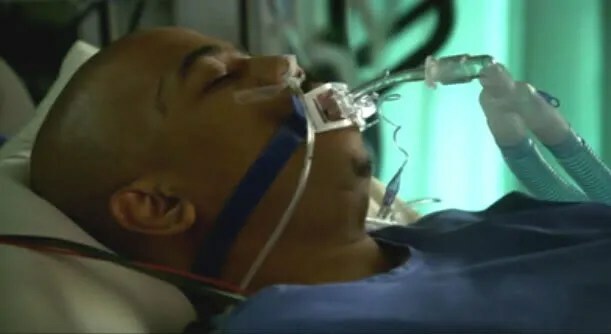 Because of that — and some contractual issues that required Omar Gooding to miss a few episodes — Lieber & Co. decided Nurse Tuck should fall victim to a stabbing in the hospital. Was Tuck's attack Serena's fault? In Friday’s episode, Dr. Deleo (Mike Vogel) brings in a patient named Todd (Chad Faust), who claimed to have been stabbed during a mugging. While Todd flirts with Dr. Warren (Elisabeth Harnois), Tuck realizes that his stab wounds are similar to those of another patient in the trauma unit. By the time Dr. Warren realizes that Todd is actually the attacker and not a separate victim, Todd stabs Tuck with a pair of scissors and flees the hospital. Gooding’s character will return, but since CBS has capped Season 1 at just eight episodes, viewers won’t see much more of him for the next two episodes. “Tuck goes away for a bit,” Lieber says. “He’s referred to in subsequent episodes in terms of his recovery, but when we come back with him, it will very much be about how having this experience of being a patient changes his point of view on the people he deals with and what the struggles are. Lieber says Tuck’s stabbing kicks off a more serialized portion of the season. Next week’s episode features guest star Kari Matchett as Tuck’s heart surgeon, who will return in the May 21 season finale. But Lieber says Tuck’s misfortune is not an end-of-season ratings ploy. That said, Tuck’s attacker is still on the loose — a plot thread Lieber hopes to explore again if the show is renewed. Did Tuck’s stabbing shock you? I’m going to miss dear Tuck, I agree with Jeffrey Lieber, he does provide a real warmth. I find the question of whether some lives are more worth saving than others a fascinating one, and I’d be very interested to know what actual trauma doctors feel about this. Around 10 years ago, I worked for a voluntary organisation that provides a listening ear to the desperate and suicidal. As well as manning the phones, I trained the other volunteers and this was always an issue we had to deal with: should we have to listen to and offer non-judgmental support to absolutely anyone, regardless of what they might have done? In our case, the answer was yes, our rules said we had to do it, and my duty as trainer was to help people find ways of dealing with this aspect of our work. Imagine taking a phone call from someone who was feeling suicidal because they’d abused a child, for instance, and you’ll appreciate the difficulties we faced. So, was Serena at fault? Should Todd have had the same care as his victim? For me, Serena was naive, inexperienced…but letting her patient die because she thought he was a bad person would not be the right call. What do you think? Should doctors have to make a moral judgment about their patients?